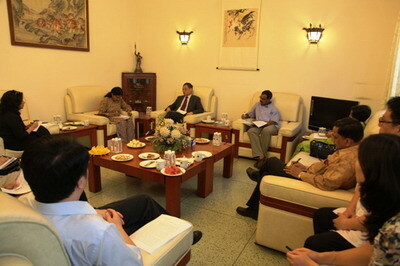 On September 17, 2012, Chinese Ambassador Zhang Yan held a press briefing on the Issue of Diaoyu Islands. He comprehensively expounded to the media on China's solemn position on the Diaoyu Islands and China's series of measures to safeguard the sovereignty and territorial integrity. Then he answered some questions. Ambassador Zhang said that Diaoyu Island and its affiliated islets have been an inherent part of Chinese territory since ancient times, and China has indisputable historical evidence and legal basis to support this claim. The so-called "purchase" of Diaoyu Islands by Japanese government is totally illegal and invalid. The Chinese government and people have expressed firm opposition to and strong indignation over this action. Any unilateral move made by Japan with regard to the Diaoyu Islands cannot change the fact that these islands belong to China. Ambassador Zhang pointed out that the wrong actions taken by the Government of Japan on the Diaoyu Islands has aroused great indignation of the Chinese government and people. Recently, China announced base points and baselines of the territorial sea of Diaoyu Islands and deposited related coordinates table and chart of the base points to the United Nations. We also send maritime surveillance vessels to the waters of Diaoyu Islands to exercise the law enforcement mission. Furthermore, we decided to present the Partial Submission Concerning the Outer Limits of the Continental Shelf beyond 200 Nautical Miles in the East China Sea to the UN Commission on the Limits of the Continental Shelf. All these measures demonstrated the firm resolve of the Chinese government and people to safeguard China's sovereign right. Ambassdor Zhang stressed that the Chinese government has always been committed to safeguarding regional peace, stability and development. The so-called "purchase" of Diaoyu Islands farce was stirred up by the Japanese government and the right-wing forces. The current difficult situation was caused solely by the Japanese side. Japan must immediately stop all actions that harm China's territorial sovereignty and return as quickly as possible to the common understanding reached between the two sides and to the track of settling disputes through negotiations. Ambassador Zhang took questions on principles of handling territorial disputes, impacts of Diaoyu Islands to China-Japan economic and trade relations, US impact on Diaoyu Islands issue, whether China-Japan dispute would escalate, the safety of foreigners and security of foreign agencies in China. Journalists from PTI, IANS, UNI, The Hindu and Navabharat Times attended the briefing.